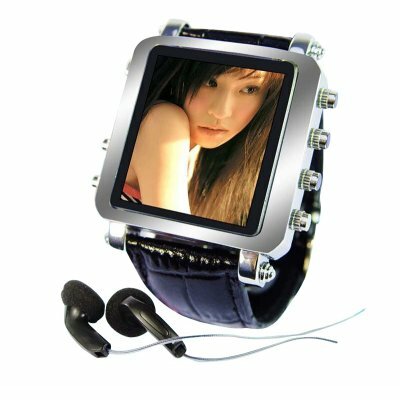 Successfully Added Mens Metallic Watch MP4 Player 2GB - 1.5inch OLED Screen to your Shopping Cart. Mens Metallic Watch MP4 Player 2GB - 1.5inch OLED Screen. Fashion at last meets MP4 Player Wristwatch Technology with the X18A by Chinavasion! on 2008-12-27 23:36:45 Great if you accept it for what it is. May not live up to your expectations. However, it does its job beautifully, just as I hoped it would. Once you got the video to the watch(a bit tiring, because of the software needed to encode), it works like a charm. Since the video image has to be small, it doesn't take up much space, so it's no problem to store several movies on it. Image quality is very nice, even larger than I expected(due to having barely noticeable spaces between pixels), and the sound is as clear as if it were a dedicated MP3 player. The headphones, though, should be replaced immediately. They do their job, but are unwieldy and tend to flatten the sound, IMO. *) A watch being able to play video and music. No more bulky walkman. *) Looks great in itself, even if you don't play any video on it. Definitely worth the money I paid. I have to say, though, I am thinking about buying a more expensive one that doesn't use the SMV format. THIS PRODUCT IS GREAT. I JUST GOT 5 OF THEM AND THEY ALL ARE FANTASTIC. THANK YOU CHINA VASION !!! NOT ONLY IS THIS MP4 VIDEO WATCH GREAT, THE SOUND CLARITY AND IMAGES ARE AMAZING. I SHOWED IT TO THE RAPPER 50 CENTS AND HE BOUGHT 100 PCS FOR PROMOTIONAL USE. MY ASSOCIATES LOVE THIS PRODUCT AND IT WILL BE SEEN ON CELEBRITY'S ALL OVER FROM NEW YORK TO HOLLYWOOD. MAKES A GREAT PROMO GADGET!!! AND THE PRICE IS ABSOLUTELY TERRIFIC.